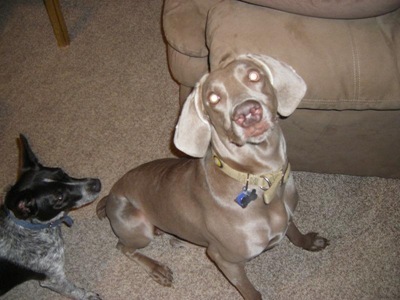 It should never be forgotten that the Weimaraner is a hunting dog and therefore has a strong, instinctive prey drive. Weimaraners will sometimes tolerate cats, as long as they are introduced to the cats as puppies, but many will chase and frequently kill almost any small animal that enters their garden or backyard. In rural areas, most Weimaraners will not hesitate to chase deer or sheep. However, with good training, these instincts can be curtailed to some degree. I explained that she is just doing what is natural for a dog to do. It's like getting mad at someone for going to the restroom in the morning. She has been chasing birds and bunnies in the backyard for two years. She had caught a bird once. This is the first time she caught a bunny. I worked with her for about 20 minutes trying to get her to release it. I pried it out of her mouth for a moment, but she put a lock right back on it. I finally relented and made her stay outside until she was done with the rabbit. I did learn something interesting in the process. I learned that a dog will not waste any part of the animal it has caught. I also learned that when you squeeze a bunny they make a squeaking sound eerily similar to those found in dog toys. And they make this sound each time you squeeze them (alive or not)! Enjoy this post? Subscribe to my blog in a reader (http://feeds.feedburner.com/robz) or by email.